Social media profiles have become extremely important to how we search for and check up on people. Employers routinely check an applicant’s social media profile before bringing them in for interviews. Current employers view the social profile to keep tabs on their employees. Potential clients screen profiles before working with a new vendor. Overall, the importance of social network profiles such as those on LinkedIn and Facebook cannot be overstated. For the first time, your online profile can determine, in part, the outcome of your business and the success of your job search. It’s time to make sure you don’t look like a social media jerk. Most people think that successful social media profiles have to have an intense level of activity and garner a huge number of followers. This might be true for social media celebrities or perhaps marketers, but it couldn’t be further from the truth for most regular professionals. The reality is that you want your social profile to convey a bit of information and not make you look like a total jerk. Check out all of your social media profiles and make sure you aren’t committing any of these common mistakes. 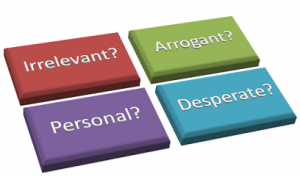 Irrelevant: Are you a sales person? Then talk about sales and the industry of your potential clients, not social media topics or what you ate for breakfast. Social media jerks talk about what they aren’t – not who they really are. Make sure your social profile and status updates speak to who you really are – you can’t go wrong by being yourself. But you can go wrong by trying to be somebody else. Be authentic. Be human. Be yourself, as you are in real life. Arrogant: Really, you’re the most connected person in New York? Winner of “prestigious” awards and a great communicator? It must be terrific to be you. Remember, LinkedIn and Facebook profiles are just like a real world presentation of yourself. Don’t brag! You can state some positive facts about yourself, but ensure your profile shows how you can solve other people’s problems or contribute to your profession. Social profiles are not a trophy case for other people to gaze at with admiration – behave like you would at a cocktail party. Personal: Chances are, when someone checks out your social profile, they don’t know you very well. When someone reads your LinkedIn profile, there is a very good chance they are doing so in order to find out about you for the first time. So let them find out about you naturally – don’t try to give them every detail of your life. Again with the cocktail analogy: profiles are a place to make an impression and maybe a little small talk, not a place to write your life history. Professional social profiles are not a place for deeply personal topics: religion, politics, family ideology, deep life goals – should a first time viewer know those things about you? Would you talk about those things in real life during the first time you met somebody? Desperate: Have you ever gone to one of those business networking breakfast meetings? Can you imagine if you walked up to each person and said, “Hi, my name is Jane. I am here to collect as many business cards as possible. Can I have yours?” When people create their social profiles, they often sound desperate. They request networking for no particular reason, they say “LOOKING FOR A JOB” in Caps, they say “I want to connect with you, email me here.” No one would ever act like this in public. If they did, you would probably think, “Man, that guy’s a jerk.” Well, the same is true for social media. 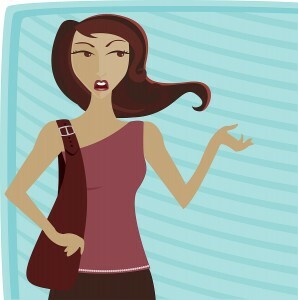 Don’t make requests or demands in a profile, or talk about how much you need something… no one wants to hear about it. Did you catch yourself committing any of these four mistakes? Did your social profile have these characteristics? Don’t worry – people tend not to judge you harshly for your social profile. Most people do not convey themselves well on their profiles, so people set the bar low for others as well. However, this is changing – as more people come online, expectations are going to rise until social media profiles are considered with the same snap judgments that we use in real life.